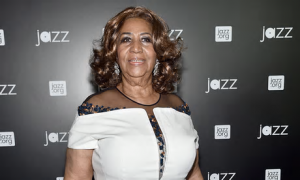 On the day Madonna celebrates her 60th birthday, I find myself writing this blog article celebrating the life of Aretha Franklin. At the time of writing, Aretha Franklin is still with us but there is a sad inevitability that her life is drawing to a close, so it is with a heavy heart that I’m preparing this obituary. Just as Madonna’s 60th birthday is life affirming, it is very arguable that she would not have had a music life and career had female soul artists like Aretha Franklin, Dionne Warwick and Dusty Springfield not paved the way in the 1960s. Although the Tamla Motown record label gave us black soul female stars like Diana Ross and Martha Reeves in the 1960s, they were part of girl group ensembles, The Supremes and The Vandellas respectively. But Tamla Motown artists were seen as pop stars – Aretha Franklin was the real deal, with genuine soul credentials following in the footsteps of Ella Fitzgerald, Billie Holliday and Nina Simone. Aretha Franklin stood alone and tall as a female soul singer in the mid to late 1960s. For this reason, Aretha Franklin is the architect of modern day R ‘n’ B, which is why Beyoncé paid tribute to her the other day on stage. She forged the path for all those R ‘n’ B singers that have followed and not just the female ones. 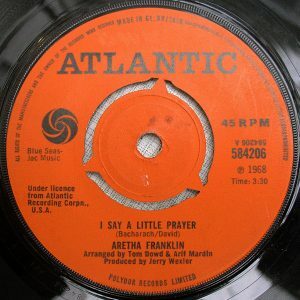 When researching this piece, I was amazed to find the all empowering “I Say A Little Prayer” didn’t reach No1 in the UK charts when it was released in 1968 – it was No4 over here and even more surprisingly only reached No10 across the “Big Pond” in the USA. Aretha Franklin had to wait nearly 20 years for her only No1 in the UK and US, her duet with George Michael “I Knew You Were Waiting ( For Me )”. However as the Queen Of Soul prepares to abdicate, it will be Aretha Franklin’s signature tune “I Say A Little Prayer” that we will all turn to for solace and comfort at the point of her departure. I’m sure music fans across the world will be joining me in a private or public vigil, by saying a little prayer for Aretha Franklin and her family and friends. Thanks for the music and the memories Aretha!! « The Wacky World of One Hit Wonders or were they?